A spacious 4 bedroom holiday home that sleeps 10. 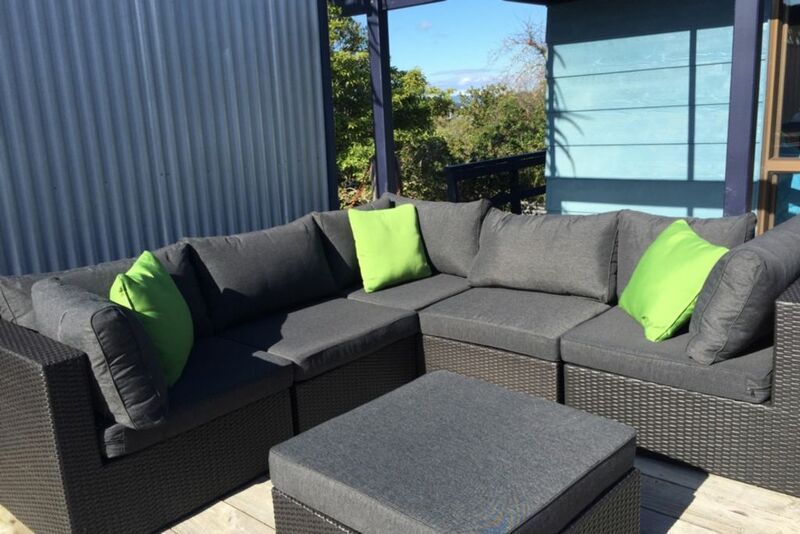 Only a few minutes short walk to the buzz of Oneroa village's (the main village on Waiheke) bars, cafes, restaurants, boutique shops, art galleries and three beaches including the gorgeous Oneroa Beach makes this an ideal escape to indulge in all the spoils that Waiheke has to offer. A 2 minute drive (15 minute easy walk) to or from the Matiatia ferry terminal or only a few minutes walk from Oneroa's (the main village on the Island) bus stops. Perfectly located within walking distance to the world class Cable Bay and Mudbrick vineyards and restaurants means you don't even need a vehicle. The holiday home is a is set over two levels with a peep of a sea view from upstairs. The top level is bathed in all day sun and comes complete with large 360 degree wrap around decks - ideal for entertaining. Recently renovated with all new furnishings and furniture. Sleeps 10 in 3 queen sized beds (all with new (2018) super comfortable Sealy Posturepedic innersprung mattresses) and 2 X 2 bunks - all with new (2018) innersprung matresses. Childs high chair and portacot available on request. The downstairs level is self contained with a large bunk room and separate bathroom/shower and entrance (ideal for teens). Perfect for two families or larger groups. Two bathrooms - one with a spa bath. Ranch slider doors open from the open plan lounge and two of the main bedrooms to sun drenched decks providing a perfect indoor - outdoor flow. The choice of sunny outdoor living areas and relaxing indoor spaces make this an ideal holiday retreat. Sit back and relax among the abundant bird life, including Tuis and Kereru (native Wood Pigeons). The wrap around decks (with that peek of a sea view) look out on to professionally landscaped gardens with a nautical theme. A quiet peaceful location makes for the perfect hideaway or getaway from the stresses of everyday life. A refundable bond is required for all bookings. No smoking inside please. Adequate property for a short stay. Lovely Bach, owners very quick to reply to all queries. As other people pointed out, downstairs is suitable for older kids or another family as there is no internal access. In need of a few minor repairs, namely the electrics downstairs, the washing machine (we had to go to the laundrette) and the main door lock. Those things aside, the Bach is lovely. It’s in a great location, easy walking distance to Oneroa with its pretty views, shops and restaurants. It’s very relaxing and peaceful. Thanks again was great to have you as our Guests. Great place and great location. It worked well for all of us. Thanks for being a great host. A lovely classic batch with great family space!